KIND represents the culmination of more than 15 years of knowledge and expertise, combined with extensive experimentation and testing. KIND provides optimal plant nutrition in perfect balance to meet your plants demands at any stage of growth, in any medium. KIND was formulated to be more versatile, easy to use, and effective than any nutrient ever created. This ground breaking nutrient system provides the ideal balance to meet the demands of the most experienced growers, and the aspiring hobbyist. KIND is hand crafted in small batches, completely dye free, and runs clean with low salt build up. A fusion of science and nature, KIND is the most technologically advanced hydroponic nutrient available today. KIND was created with specific N-P-K ratios that were optimized to allow 100% customization. This allows the user to adapt to the specific needs of any grow media, at any stage, while maintaining the ideal balance for optimum plant growth. The proprietary KIND formulas eliminate the need for separate calcium and magnesium supplementation to compensate for water quality or specific grow medias. This level of control is ground breaking and allows you to maximize growth for any plant, in any environment, no matter what KIND you grow. 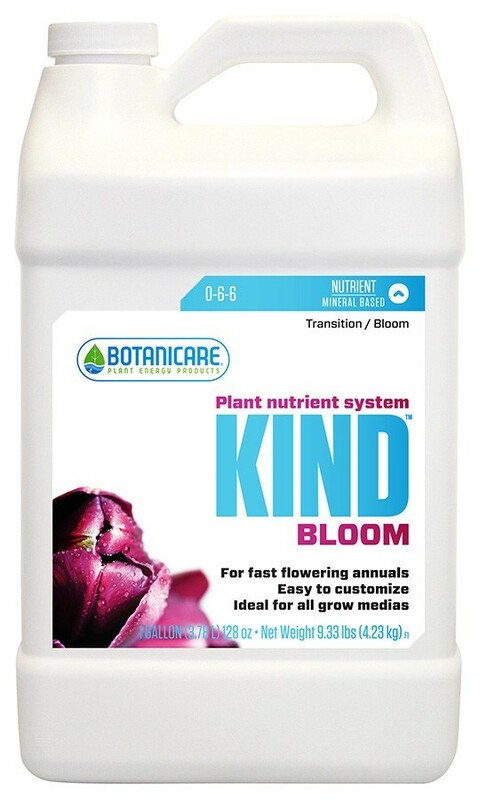 Kind Bloom was formulated with an optimal phosphorous to potassium ratio to encourage healthy branch and stalk development, accelerate flower sets, and maximize crop yields. This ideal ratio provides higher potassium levels to increase biomass while amplified phosphorous levels stimulate flower initiation. 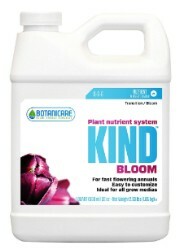 Kind Bloom also includes an elevated level of magnesium which increases photosynthetic efficiency; critical for achieving optimum yields in accelerated growth environments. 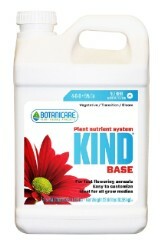 Kind Bloom was developed specifically for fast growing annuals. Kind Bloom allows you the ability to increase the amount of potassium and phosphorous during peak flowering and ripening phases without additional boosters. Adjusting these ratios promotes maximum fruit swelling, yield, and quality. This is easily accomplished by simply increasing the Bloom, and lowering Kind Base which limits the amount of nitrogen available without compromising trace minerals or magnesium. 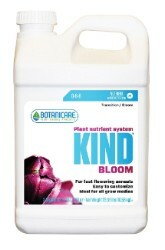 Kind Bloom provides the complete nutrition your plants require to maximize both yield and quality. No matter what Kind you grow, or what you grow in- KIND is the last nutrient you will ever need. 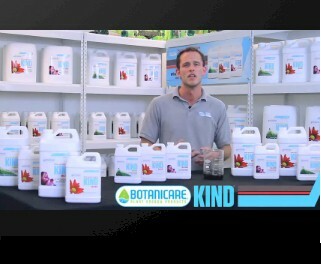 KIND's unique formulation is easy to customize for specific plant needs, growth cycles, and grow medias.